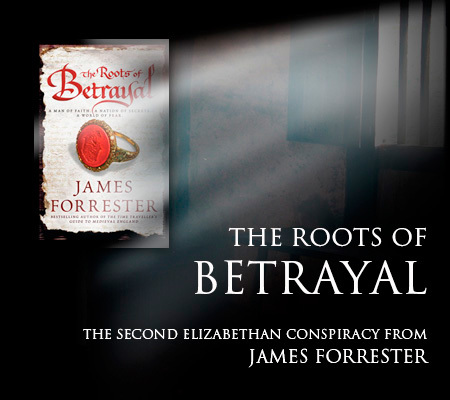 "James Forrester captures the sights, smells and dangers of Tudor England and tells a gripping story." May 1564: Catholic herald William Harley, Clarenceux King of Arms, is the custodian of a highly dangerous document. When it is stolen, Clarenceux immediately suspects a group of Catholic sympathisers, the self-styled Knights of the Round Table. Francis Walsingham, the ruthless protege of the Queen's Principal Secretary, Sir William Cecil, intercepts a coded message from the Knights to a Countess known to have Catholic leanings. He is convinced that Clarenceux is trying to use the document to advance the cause of the Catholic Queen. Very soon Clarenceux enters a nightmare of suspicion, deception and conspiracy. He finds himself on the run, alongside charismatic outlaw and pirate Raw Carew. United in rooting out the truth, they are divided by their character and methods: one is a man of faith, the other is quick to draw his knife. As England teeters on the brink of bloody conflict, Clarenceux knows the fate of his country and countless lives will be determined by their actions. Published by Headline Review on 7 July 2011.